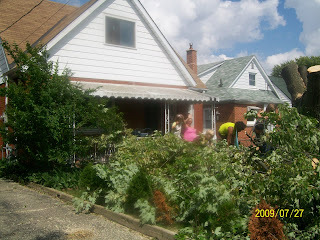 Mom's Musings: ...and the tree came tumbling down!! 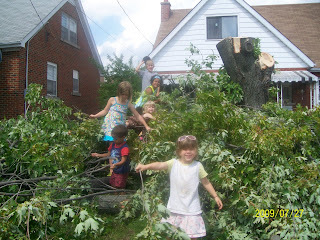 ...and the tree came tumbling down!! 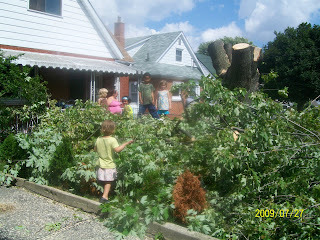 We had a massive storm come through yesterday, with winds and hail and lots and lots of rain. I am sure the tree would have come down into Mr. H's room. So glad we dealt with it quickly!! The kids loved playing in the jungle...and losing their shoes amongst the branches!! Now I have a naked yard...I will have to take an after pic of it:-) Am looking forward to planting a bylaw acceptable, really tall, wildflower garden next year!! Just because I love my neighbours! I'm sure the kids will always remember this.